Los Angeles Times music critic calls Dudamel "a phenomenon"
LOS ANGELES, California (CNN) -- He got a standing ovation before the orchestra even played a single note. Gustavo Dudamel has been compared to the legendary Leonard Bernstein by one critic. For weeks now, anticipation has been growing for the arrival of fiery young Venezuelan conductor Gustavo Dudamel to take over the Los Angeles Philharmonic, and the crowd couldn't wait to roar its approval at his arrival. Dudamel, 28, engenders a passion among music lovers that is entirely new to the world of classical music. Tickets for his Saturday debut as music director of the Los Angeles Philharmonic disappeared within minutes -- the fastest sellout in the history of the 18,000-seat Hollywood Bowl. Swed was in the audience two years ago when Dudamel conducted the Simon Bolivar Youth Orchestra at the Walt Disney Concert Hall, delivering a reading of Beethoven's Fourth Symphony that left fans delirious. "I haven't seen that kind of reaction from a crowd since I saw the Beatles at Dodger Stadium," Swed said. The Latino population is set to nearly triple by 2050. Soledad O'Brien journeys into the homes and hearts of a group destined to change the U.S. Witness the evolution of a country as Latinos change America and America changes Latinos. Dudamel's face has been a common sight for months in Los Angeles. His billboards look down on freeway commuters. He adorns city buses. At the famous Hollywood hot dog stand Pink's, there is even a dog named in his honor -- the "Dude Dog," piled high with jalapeno peppers, guacamole and tortilla chips. While it's not exactly Venezuelan cuisine, in Los Angeles, there can be no surer sign that the conductor known as "The Dude" has arrived. 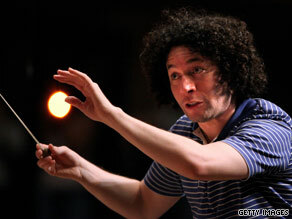 So where did Dudamel get this musical magic? He said at least a part of his talent is inherited. "I started studying music when I was 4," he said. "I wanted to play trombone like my father." Soon young Gustavo entered into El Sistema, Venezuela's state-financed music education program. Hundreds of thousands of children have received instruments and music instruction through the nation's massive system of youth orchestras. "You cannot imagine," said Dudamel, "how it changes the life of a kid if you put a violin or a cello or a flute [in his hand]. You feel you have your world. You have your life there, and it changes your life. This happened to me." As music director of the philharmonic, Dudamel said he hopes to spread a little of the El Sistema magic in Los Angeles. He already has organized one youth orchestra in the run-down neighborhoods of south Los Angeles. Those music students opened for the orchestra at the Hollywood Bowl. The concert also featured student musicians playing alongside jazz legend Herbie Hancock. Cuban pianist Alfredo Rodriguez and bluesman Taj Mahal rounded out an eclectic bill designed to pull in a broad cross-section of music lovers. But it was Dudamel and Beethoven's Ninth Symphony that brought the crowd to its feet at the concert's end. It was a promising beginning for a man many are hailing as the savior of classical music. They hope Dudamel can bring a whole new audience to symphonic music, and believe the Los Angeles Philharmonic is the perfect podium for the young maestro. "He fits in with this town in a lot of ways," Swed said. "Obviously being Spanish-speaking in a city where the majority of people either speak Spanish or understand some Spanish ... you know he fits in. The youth culture? He is young. He is also great, which doesn't hurt."